*The street numbering system in Eugene changed in 1913. Thus, some of the theaters have addresses that do not conform to contemporary locations, or have two different addresses, although they stayed in the same physical location. 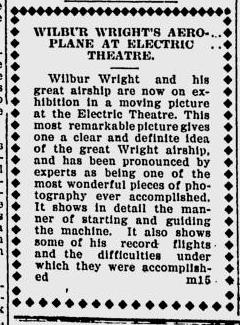 The Electric Theatre was in operation on the 500 block of Willamette St. next door to Julius Goldmith’s cigar shop at 531 Willamette. The theater was in the wooden Hodes building on a lot measuring 22’ x 160’. Mrs. M.E. 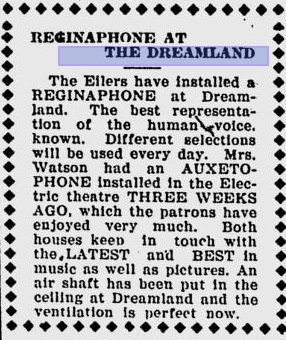 (Martha) Watson ran the Electric simultaneously with the Dreamland theater a few doors down. The Electric showed the short films popular in nickelodeons at this time, such as “Crack Riders of the Russian Cavalry” (1908), and film of the Wright Brothers historic airplane. The Electric used an “auxetophone,” an early type of gramophone, as sound accompaniment to the silent films. The theater building was irreparably damaged in a large fire that destroyed many of the buildings in downtown Eugene on May 25, 1909. The fire was not a projector fire, but one that started in a livery stable on Willamette St. Later that year, Mrs. Watson tried to sell the remains of the building and have it removed in order to build a new brick building on the same lot. In 1910 she opened the Folly theater in the new building.